Is Counseling an Option for You? Many people call me and tell me that they want couples counseling, but their partner is unwilling to join in the effort. 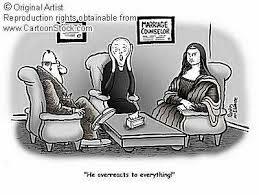 Instead, the partner might say, “I don’t NEED counseling. You are the one who NEEDS it.” As a San Diego couples counselor, I am quick to point out that relationship dynamics are always co-created. No one person is to blame. No one person is the one who NEEDS it. Besides, people who point at others as the one who is the problem tend to be extremely anxious. One typical sign of axiety in a relationship is the tendency to blame another rather than the ability to “see” your part in what has gone wrong. At my practice in Mission Valley, I accomodate working couples by taking evening appointments. I also see individuals and couples on a sliding fee scale. It is my fervent belief that psychotherapy, whether for an individual or for a couple, is an experience that requires the courage to look within. If you want to learn more about my resiliency-based model of practice, visit me at http://www.Cunninghamtherapy.com or call me at 619 9906203. The stock market took a huge nose dive this week, in the face of of jangling nerves about financial reform. Many financial advisors thought they could get their clients some great deals. Although there were modest gains at the end of the week, the market is still down. Thus, there were no great deals to be had. Markets are like people. They don’t like uncertainty. Yet it is only by taking huge risks…whether with your wallet or with your emotions…that great gains can be had. The nature of change IS uncertainty. Uncertainty breeds heightened anxiety. In order to change the dynamic in an unhappy couples relationship, it is required that both people change. The dynamic is co-created. Neither partner is solely to blame. Changing your part will make you feel anxious in the short term, but there can be long term gains. Just hold on! The work is to keep your eye on your own part rather than focusing on blaming your partner. Even if 99 per cent of the trash is on your partner’s side of the street, if you just sweep up your one per cent, you can affect change. To learn more about Dr. Cunningham’s model of practice, visit http://www.Cunninghamtherapy.com. At her couples practice in San Diego, she sees clients afternoons and evenings to accommodate working couples.